Earlier this week, the cherries on my ‘Bali’ cherry tree looked like rubies; they were shiny, lush, bright red and definitely ready for picking. So after removing the layers of netting that kept the birds off the tree, I got to work picking. When positively ripe, ‘Bali’ cherries come off easily, and I pitted most of the cherries right on the tree. A gentle squeeze on the fruit, a slight tug, and a perfectly pitted cherry went into my pot. Those cherries that still had the pits in them went into a separate pot for pitting in the kitchen later. On my 3-year-old tree, which is less than 5 feet tall, I harvested about 15 cups of cherries total. Not bad for such a little tree — and it makes me hopeful about future harvests, which are said to be enormous. I could hardly wait for this cherry pie to cool! Once picked, I cleaned the cherries by swishing them in water. One problem with the pit-on-the-tree method is that you have to be very gentle in cleaning. You also need to process them immediately. I put the cherries in appropriately sized containers, sprinkled about 3/4 cup of sugar on them per 6 cups of cherries and froze them. This morning, I started making a basic cherry pie. Having lost many times in the now-defunct Northfield News pie-baking contest — an event this community sorely misses, I don’t claim to be a great pie-baker, but these pies were winners. For the crust, I used a recipe my Mom gave me, which I believe came from her Mom: For every 1-1/3 cup of all-purpose flour, add 1/2 cup shortening, a half-teaspoon or so of salt, and a tablespoon of sugar. For a two crust pie, go with 2-2/3 cups flour, a cup of shortening (what type is your choice — my Grandma no doubt used lard but I stick with Crisco with maybe a dab of butter for color), teaspoon of salt, 2 tablespoons sugar. Cut the shortening into the flour, salt, etc. mix with two forks or your fingers until it is the size of small peas, then add just enough ice water to pull the dough into a ball. Shape the dough into two disks, one for each crust, wrap in plastic or wax paper, and put in the refrigerator for one hour. Letting the dough rest an hour is the key to easy rolling of your crust. After the rest period, preheat your oven to 425 F. For the filling, mix together 1-1/4 cups sugar (1/2 cup, if using previously sugared frozen berries), 3 tablespoons of corn starch, and a good shake of cinnamon. Stir the sugar mixture into 6 cups of tart cherries. Add a 1/2 teaspoon or so of vanilla. (For a fancier, more explicit recipe, check out Martha Stewart’s cherry pie.) Roll out your bottom crust on a floured board, fit it into a 9-inch pie pan. Add the cherries and a few dabs of butter on top of the filling, then roll out the top crust and put that on top. Crimp the edges to seal the crust, and cut a couple of slashes or an artistic design into the top crust. You could put an egg wash on the crust and sprinkle it with sugar, or just stick it in the oven. I always put my pies on a baking sheet to prevent a smelly house in case the pie juices ooze out of the pie. Bake the pie at 425 for 12 minutes, then turn the oven down to 350 and let it go for at least 45 more minutes — it may take longer. The filling should be slowly bubbling and the crust should be golden brown when it is done. 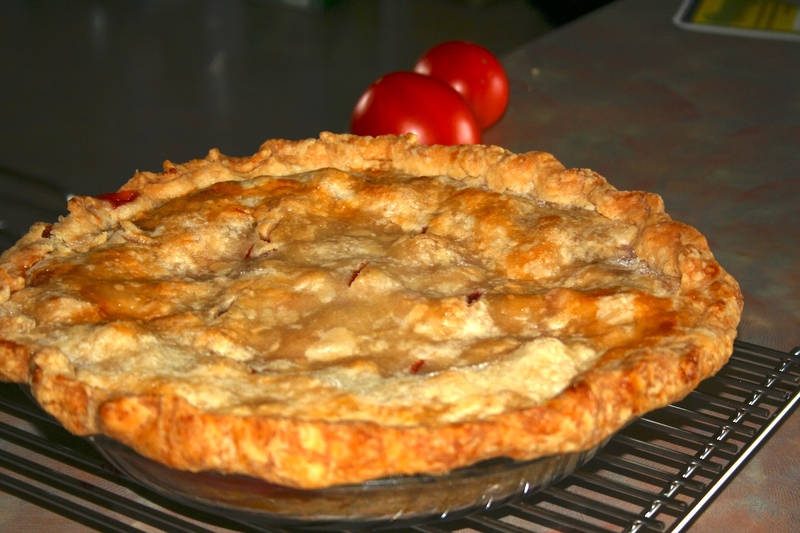 Let the pie cool completely before eating, unless you like soupy pie. I also tried this multi-berry variation, which my husband preferred to the plain cherry: Follow the recipe, except instead of 6 cups of cherries, use 2 cups each of tart cherries, blueberries, and raspberries. Wow! Sounds so good! 15 cups… wow! This sounds so good! I can’t wait until my Bali starts producing. Mine is three years old, but this is the first year it didn’t get “pruned” by deer. Of course, then the crows got at the cherries… life is rough here in Wisconsin for a cherry tree!